Mercury Theatre II was a spectacular presentation of video and sound art using Cathedral Park as a setting to contextualize the theme, "The New Barbarians". For the 2004 theme, artists shed new light on the term "barbarian" While the previous year's event looked at Vancouver as a sci-fi landscape, this year's program takes sci-fi one step further to look at that which exists in our everyday landscape - that which is forever base and unchanging, the part of humanity that never evolves or advances. Once a barbarian, always a barbarian! Footage was shown that takes various positions, from works that critique Western culture as a barbaric force to those that embrace "barbarianism" as the new order. In order to expand the scope of Mercury Theatre for 2004, Intermission sent a call for sound and video submissions Canada-wide this year. Over 20 artists have sent in works from across our fair land that were mixed live at this outdoor event by Intermission and featured guests. "what a great event! you did an amazing job. the screens were beautiful, horrendous...i love intermission." "I fully enjoyed the performance. The music was totally haunting. I was impressed with the subtlety of the images....that 9/11, and the war, etc weren't being smashed into our eyes." Julie Gendron performed a Live Video mix, of painterly constructions. 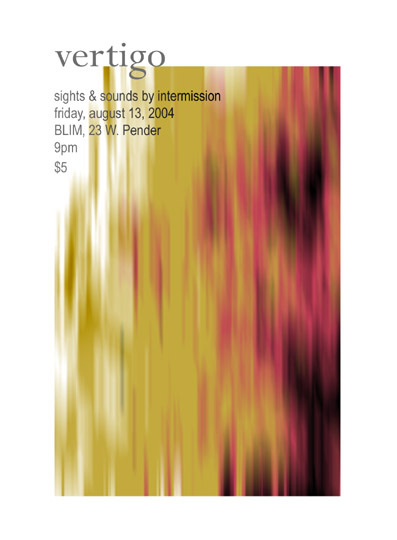 The intermission band, will be backing her up, with a their/our brand of live improvised electronica - a practice of communication through music on a walk-about which is never the same but aways an intriguing journey. In this process the 'score' is encoded directly in the music as communication between the players, as they ask and answer questions reminiscent of "Shall we go this way?" or "Can you dig this?" Visual/Music/Community improvisation at Cathedral Park (Dunsmuir & Richards). Visuals mixed live from submissions by Vancouver Artists, depicting Vancouver as a Sci-fi landscape. Music performed by invited guests and Intermission. A full evening of sound-based performance art, Raw On will feature an array of works by local artists promoting their own 'brand' of experimental activism. Raw On performances will thrust experience to unknown and novel ends by imposing limits on everyday activities. Testing the thresholds of common sense, Raw On is set to prove that the only true action is active action. A live soundscape performance hybridizing punk and contempory electronic sampled music techniques. Special guests; Erin Kursietis (saw) and Krups (beer bottles) @ sugar refinery. as part of the Vancouver New Music [homepage] ongoing series experimental music, the anamorphosis performance addresses the imminence of the real. 80min live improvised video and sound performance @ Havana Theater. A live alternative sound track was for performed with Stanley Kubrick's Dr. Strangelove, Or: How I Learned To Stop Worrying And Love The Bomb. 100min A/V Performance @ i just want to MAKE MUSIC TO YOU, Clove, Commercial Drive.